The Axel Einar Hjorth Archive collect and spread information about the work of the swedish architect AE Hjorth. We will be happy to get and supply you with information available. To get in contact with the AE Hjorth archive please fill in the form below. Your question will be answered asap. 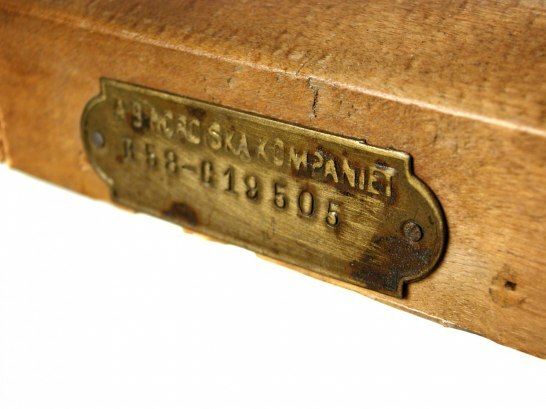 If you have a question on a specific furniture produced by Nordiska Kompaniet, please attach the NK-tag number. his life changed dramatically: he was placed as a foster-child with a well off family. and left with no heritage, he was forced to break off his studies without examination. but placed Axel Einar Hjorth yet again amongst the bourgeoisie. Hjorth's major customers and they had models of his in production right up to the forties. participate in the Paris exhibition that year – nor was Stockholms stads hantverksförening. society as a whole and particularly in Swedish industrial art. very distant from the socially oriented ideas characterizing the activities of Svenska Slöjdföreningen. exclusive industrial art of the 20s through the 40s. exhibitions at the department store itself every year. was typical for the exhibition. Axel Einar Hjorth carried on working, alternating between running a shop and managing a architect office.